At this time of the year, trends, forecasts and innovations that are driving the technology industry forward are often summarized, and an outlook for the New Year is given. And according to some experts, this coming year will be the year of the blockchain. The management consultancy firm McKinsey & Company, for example, expects 20 to 30 proof-of-concept use cases for blockchain technology in 2018, with 10 to 20 successful business cases. One area likely to be heavily influenced by the technology is the supply chain. Traceability and trust play a major role here for all parties involved in the supply chain such as logistics service providers and end consumers. Four important characteristics of blockchain can bring about significant change to the supply chain. Let’s take a closer look at the benefits of blockchain for the supply chain and why it could revolutionize some processes in 2018. Blockchain is a shared database technology that links different parties of a single transaction. 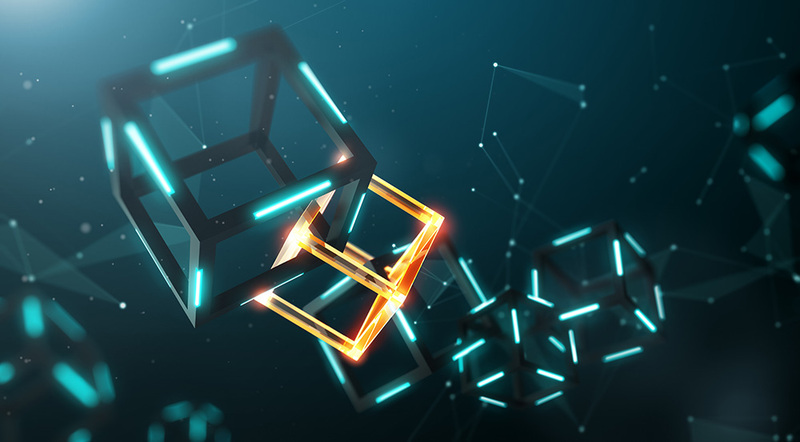 In this process, the transactions are combined as information in blocks and linked to other transaction blocks, which ultimately results in the “chain”. In this way, the data is stored and encrypted in a decentralized manner. In the supply chain, different information could also be linked together in this way. For example, supplier information with delivery, inventory and financial data. This could create shared networks between production, trade, logistics service providers and banks. This data can then be viewed by all parties involved. As a result, the data is verified. Subsequent manipulations are very difficult. Various safety mechanisms have been installed for this purpose. The legality of each transaction is verified beforehand, and the transaction is confirmed by the majority of computers in the network. Manipulation would therefore require an enormous effort. In addition to the actual data, each block contains information for verification of the preceding block. If a block in the blockchain is manipulated, all subsequent blocks must be created again. Since the analytical effort required for this is usually only realized by the majority of the network, not by individual subscribers, security against manipulation arises. Basically, the blockchain is a decentralized protocol for transactions between parties, which records every change transparently. This creates overall transparency amongst the various parties, which is not otherwise possible. For example, was the cold chain of a product interrupted? If so, the parties concerned will receive a notification in the supply chain. Within seconds, it is then possible to trace which product is affected, as product information such as the origin of the factory, batch number, processing data, expiry dates and delivery details are stored in the blockchain. As a result, food retailers and other members of the network can quickly trace contaminated products back to their source, immediately take them off the market and reduce the spread of disease. Supply chain transparency is now also playing a major role for end consumers. In the food retail sector, in particular, there are numerous gift opportunities for the blockchain to give to the supply chain, for example, traceability and reliable information on the origin and condition of food. By offering to track every transaction in real time, the consumer trusts the supply chain. The origin and processing of goods is becoming increasingly important for consumers and would therefore be welcomed by buyers. The end consumer can gain this information from the barcode. The supply chain would certainly be pleased to have this transparency and the trust that comes with it in the new year. Thanks to blockchain, supply chains would no longer have to face bad reviews or scandals in 2018. And the food industry is just one of many examples. Regardless of the industry, blockchain can make supply chains worldwide more transparent. Next year, supply chains will, of course, be particularly pleased with the time and costs that the blockchain will save them. Electronic documents eliminate error and speed up data transfer. This saves time in handling logistics processes. In addition, many processes can be automated thanks to secure transactions. Take, for example, the delivery of goods to and from a plant. An automated inspection and monitoring of goods is possible through the blockchain. This simplifies and accelerates the process again and again. The stock can then be updated automatically. Many administrative processes in the supply chain can be eliminated. The complexity of administration in supply chain management must be considered: For a batch of flowers, it requires about 200 paper documents from over a dozen suppliers, which record whether all hygiene regulations have been complied with or whether the flowers are free of insects. In addition, a consignment note is used by many parties in the supply chain: exporters, importers, insurance companies, customs officials, terminal operators, forwarders, drivers. Thanks to blockchain, anyone can access the documents in real time and instantly see changes in the status. Of course, this transparency also immediately makes inefficient parts of the supply chain visible, making it then possible to quickly improve them. This results in long-term cost reductions. Blockchain opens new opportunities in supply chain management, including real-time decision making between supply chain partners. Continuous real-time access to a supply chain with all related transactions makes it possible to work iteratively. For instance, a company that knows in advance that a delivery contains only some parts of the ordered goods can reschedule and access its own warehouse stock, order the missing goods from another vendor or renegotiate the price. It can redirect a container to another warehouse or release capacities in the warehouse, on the transport truck or at the loading dock to reduce costs. In the event of a discrepancy, each affected supply chain participant will be notified directly as described above. Happy New Year, Supply Chain! The blockchain will fulfill almost every wish for you in the new year. From unrestricted transparency and security against manipulation to cost and time savings and real-time decisions of all parties involved. What features of the Blockchain do you see particularly useful for the supply chain?